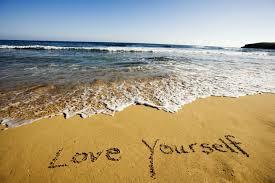 Self love is spoken about all day everyday but no one ever seems to be able to define or explain it. Self love is the opposite to self criticism. Self love is the opposite to self abuse and self hatred. Self love revolutionised my life. In all honesty, I never realised my body positivity wasn’t complete until I found true self love. Yes I loved my body, but I never wanted to be alone. Yes I loved my body, but I couldn’t spend time with myself. Yes I loved my body, but I didn’t like myself. For 3 years, I lived my life like this and if you introduced me to a person who genuinely loved themselves, I would have found them arrogant. THAT IS WHAT HAPPENS WHEN YOU DON’T LOVE YOURSELF. When you don’t love yourself, you turn your hatred outwards. Self hatred is taught + the only cure was self love and self compassion. So be careful where you are learning your definition of self love from. A person who doesn’t love themselves, can’t teach self love. You wouldn’t learn how to be rich from a poor person, so why would you learn how to love yourself from someone who clearly demonstrated actions counter to that. There is no end goal but please learn from someone who knows what they are talking about. Social media doesn’t check people’s experience or qualifications or knowledge but YOU MUST. It’s your mental health at stake. Recovering doesn’t make them an expert in recovery. People get trained because it teaches you about ALL the ways to recover, not just one. People don’t become qualified as coaches/ therapists and that’s it – we stay on top of our craft, update our knowledge with courses, books and research. I didn’t learn to do what I do by gaining followers, I did it by actually studying.